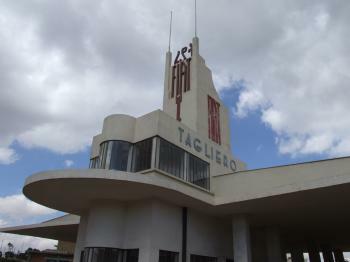 Asmara: A Modernist African City is an Italian planned colonial city based on early modernist architecture. The urban ensemble was designed during several stages of development on an orthogonal grid plan with diagonal axes. The city was divided into quarters following the principles of racial segregation. 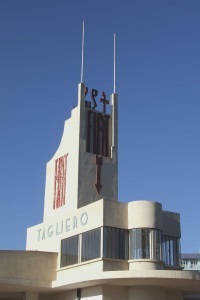 During the short fascist period of 1935-1941 the city received its distinct modernist and rationalist public buildings, which mostly have survived intact since then. From TWHS "The Historic Perimeter of Asmara and its Modernist Architecture" to WHS nomination "Asmara, Africa’s Modernist City", and then again by ICOMOS to "Asmara: a Modernist City of Africa”. Garden City Movement: "The plan is also an early example of the implementation of urban zoning principles, championed by the contemporaneous Garden City Movement." Modern Urban Planning: "The creation of a complete urban landscape arising from the early implementation and continuous adaptation and development of modern urban planning theory in an African context at a vital stage in human history – between two world wars – is one of Asmara’s unique qualities" - see "brief description of nominated site"
Cathedrals: Enda Mariam Cathedral - cathedral of the Eritrean Orthodox Tewahedo Church.